Want To Learn More About SEO? Subscribe To Get The Latest FREE Updates. 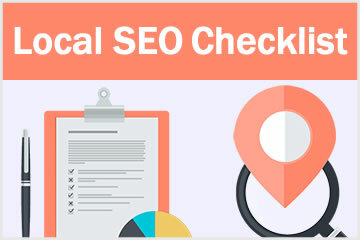 Enter your email to receive our “Local SEO Checklist” instantly. It's Free! 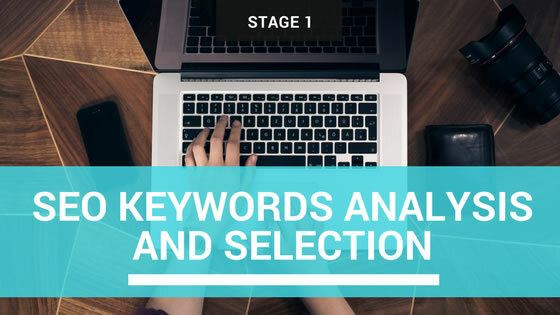 Keyword analysis and selection is the first and important step in a SEO process. It is always recommended to choose the common keywords which relevant to your business and with high monthly searches. Let’s take an example on an online shop selling fashion cloth to Malaysian. First, we can brainstorm any possible keywords which relevant to our content. Alternately, we can use Google Planner (https://adwords.google.com/KeywordPlanner) and click on “Search for new keyword and ad group ideas” to start the searching. Enter relevant keywords in the “Your product & services” text box. Make sure Targeting is set to “Malaysia” and click “Get Ideas” button. In the result page, click on “Keyword Ideas” tab to see the monthly searches and competition score. You may sort by “Avg. monthly searches” to find out the best keywords. Here is the result in the “Search Term” section. 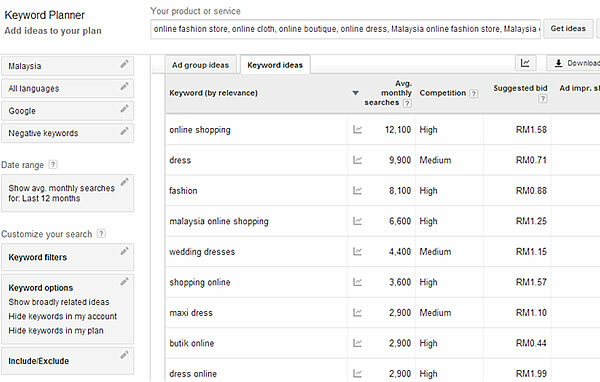 Based on the analysis, “Malaysia online boutique” appears to be the top search keywords which potentially become your primary keywords. You can further sort the “Avg. monthly searches” in “Keywords (by relevance)” table to find out other potential keywords. From there, we find out “wedding dresses”. 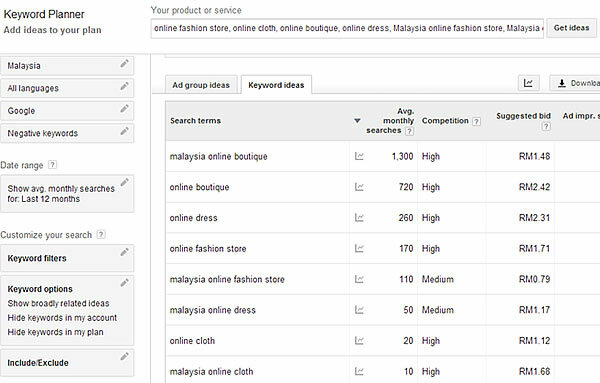 “Maxi dress”, “butik online” and “dress online” seems to be good keywords with high searches. High monthly searches mean you should choose the keywords that search by many people. Higher searches always bring more visitors to your website. If you are targeting 20 monthly searches keywords, the most visitors will be only limited 20. You need to make sure the selected keyword is relevant to your product and services. There is no point to bring a visitor looking for wedding dress to your website which is selling baby cloths. It is easier to rank high with low competition keywords. There are certain keywords which had been already dominant by the major players which are very difficult for you to rank over them with the limited budget. The smarter way is choosing other related keywords which may have lower searches but still able to bring visitor to your site. Remember, most visitors only visit page 1 or 2 in the search result. You need to make sure your keywords can rank high easily. Competition can be check from the “Competition” column. You need to choose the keywords which potentially make sales from your website. Take an example on “DIY a dress”. Those who search this keyword may not likely to buy and spend money. What they are looking for is just to find a method on how to make a dress by them. On the other way, if visitor search for “buy dress online”, this can be a high commercial value keyword where they most likely will spend money to buy a dress online. Here is another example of “SEO Malaysia” and “SEO”. SEO is big general keywords. Visitors who are searching for SEO may just want to know what is SEO. But visitors who are searching for SEO Malaysia most like want to look for SEO services in Malaysia. This rule is important to make sure you bring visitor that ready to spend money to your site rather than those who are just searching for information. You can refer to the suggested bid column; the high value means more people are bidding the keywords in Google AdWords. This also means it is high commercial value. Base on the result and our 4 golden rules, we can decide “butik online”, “dress online”, “wedding dress”, “Malaysia online boutique” can be good primary keywords. If our website is selling dress, “dress online” and “butik online” can be good primary keywords. 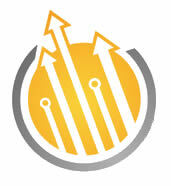 Learn more about simple steps to help your site rank better. We are a team of SEO experts or known as Pakar SEO in Malay language offering SEO consultation services in Malaysia. We constantly share our SEO strategies and tips in this website for small business owner who likes to improve their search engine visibility and get more customer from the internet.